Holiday Chihuahuas | MWAH! S&P Shakers Figurines | One Price Low Flat Shipping! From the Mwah! 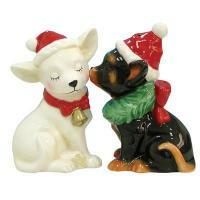 Salt and Pepper Shakers Collection by Westland Giftware, Holiday Chihuahuas. Made of ceramic. Measures 2.25" tall. Hand wash only. This adorable 2 piece salt and pepper shakers set features a black and tan chihuahua with a wreath around his neck kissing a white chihuahua wearing a red Santa hat and a collar adorned with a jingle bell to match! A strong small magnet holds these sweethearts together!